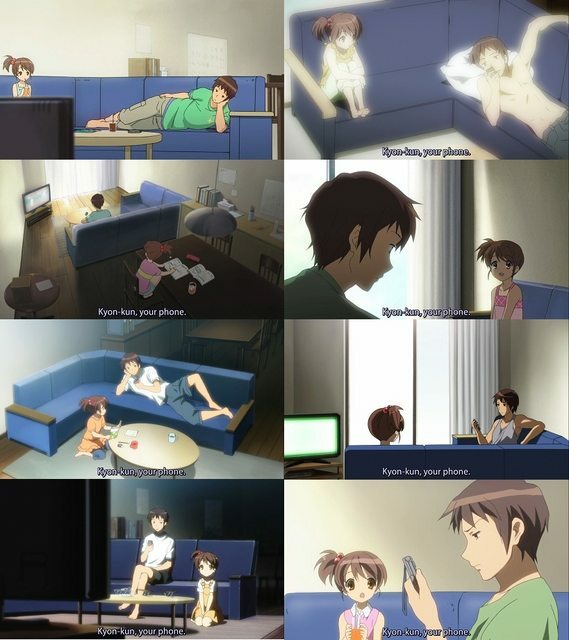 In Haruhi second season, there was 8 episodes that have been the same. The series of "Endless Eight" episodes are literally doing the same things over and over again. But it's not really the same thing, they re-animating and re-dubbing whole episode, they didn't being lazy and use the same source. As you can see they give different tones, angles, outfits, etc. That's too much effort for same situation all over the episode for eight episodes straight. So why did they doing it? Did they also did it in light novel? What is the point of "Endless Eight"? Most likely the last arc of the show was originally planned to adapt The Disappearance of Suzumiya Haruhi, but the producers changed their mind well into production, and decided to make it into a movie instead. As a result they had to fill in a seven episodes gap that they already bought the timeslot for, thus this gimmick was born. They Endless Eight chapter in the novel is only about the very last iteration where Kyon figures out the solution. The point of Endless Eight was to provide a reason for Nagato to do what she did in Disappearance, being the only one to remember the over 15000 iterations. Stories with time loops commonly center on correcting past mistakes or on getting a character to recognize some key truth; escape from the loop may then follow. The episodes initially aired between 19.06.2009 and 07.08.2009, which may be why these episodes have such a bad reputation: the audience may have already suffered from the silly season and these episodes added more frustration on top. It might be a bit far fetched, but I think this is also a play on how cool an endless summer break initially looks to pupils and students for as long as they don't know what to do with all their time until they realize that they are right in the middle of the silly season and that an endless summer break could also mean an endless silly season. As senshin already pointed out in his comment, the reason why they choose to make this story arc span accross eight epsiodes is probably because 8 looks like the sign for infinity: ∞ ( which surely is another trope or meme they choose to play with but that cannot find right now). No one knows why director did it or what purpose it served. In the novels themselves, only last "loop" was recorded and the whole thing spanned not even 100 pages. If I were to speculate, then only reason why they did what they did was because number of coincidences during airing of the episodes were so high it was too good to pass on the opportunity. Also, if they didn't waste 8 episodes of it, then they would need to adapt some other material, which by the time of the show was just "Dissapearance" arc, something that later got much better movie adaptation.